I’ll never forget my first experience of Great Gable. It was during a geography field trip to the English Lakes, I was callow youth of 17 and, up to that point, the landscape opening up all around had belonged on biscuit tin lids and boxes of fudge. Walking up Great Gable was one of the expeditions our patient, and in retrospect amazing, teachers dragged us on in search of glacial landforms; not that you need to look far for these in the Lake District. And, before some braggart points out that they have experienced bigger or better examples of glaciated mountain terrain elsewhere, I will gladly acknowledge that Holland is probably the only country in the world with smaller peaks than England’s. And, of course, there are plenty of other places in Britain, not least Wales and Scotland, in possession of their own unique wonderfulness. English mountains are beautifully compact and formed though; and Great Gable, viewed from the south-east across the brooding depths of Wast Water – at 243 feet (74 metres) England’s deepest lake – is the classic mountain shape, an inverted ‘V’. It’s like a huge, lumpy, pyramid; you can see why it’s called Great Gable. Indeed, it’s such a recognisable outline that it features in the Lake District National Park’s logo. 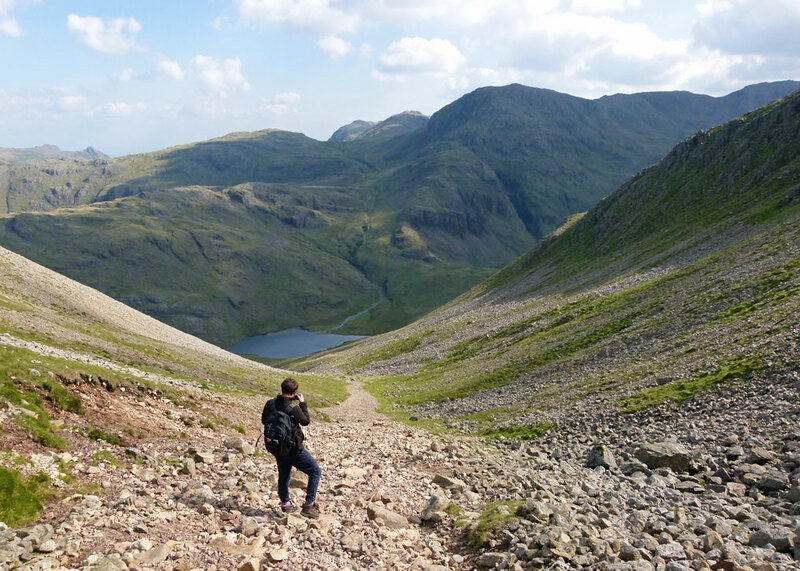 I’ve walked, clambered and staggered up Great Gable at least half a dozen times since those far-off school days. 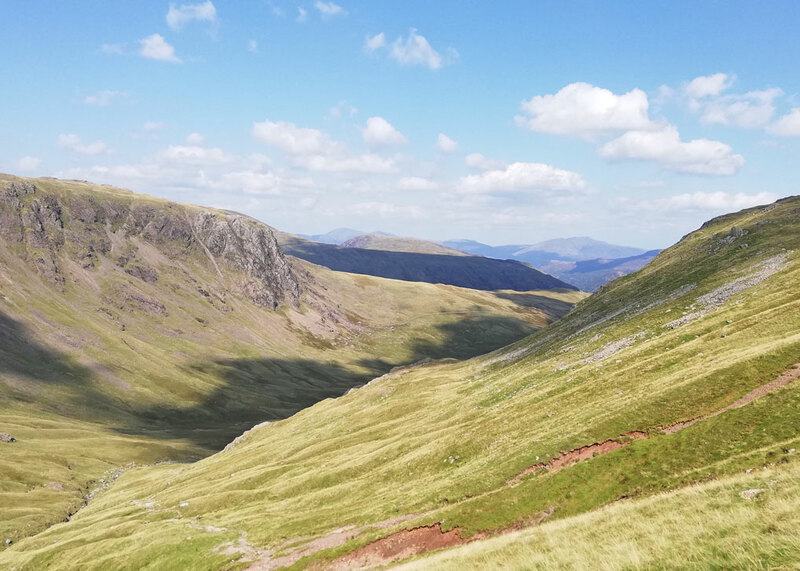 In fact, though it can be tackled by anyone reasonably mobile of most ages, and is approachable from most directions, all routes to the top of Great Gable require care and a degree of energy; some necessitate nerve and skill as well. 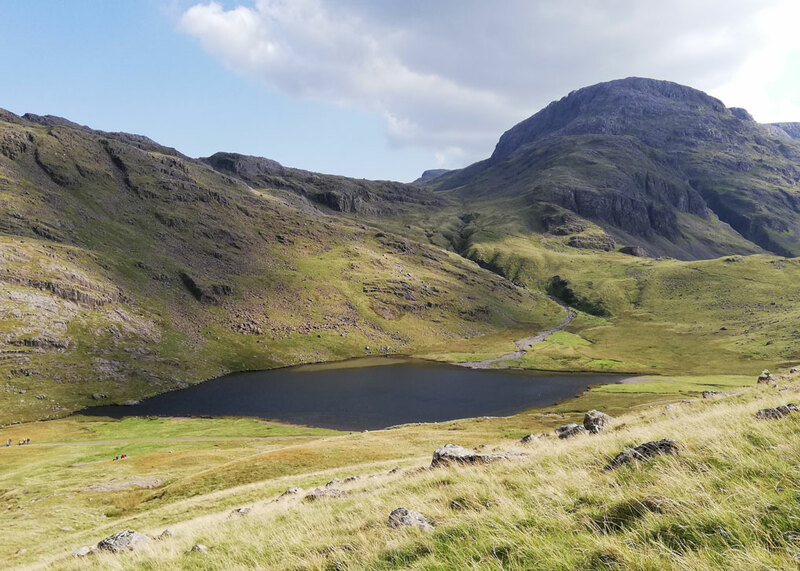 The Lake District may look pretty, but its fells still claim lives every year – often due to carelessness, but even experienced walkers and climbers are not immune from accidents. So, the last thing you do on Great Gable is mess about on it. It’s more than irritating, too, that some people don’t wear the proper kit, bother to carry appropriate supplies, or even take a map. They’re the walking equivalent of careless drivers, putting other people’s lives at risk; eventually, we all have to grow up. It was Son of Britain who most recently persuaded me that I wanted to spend a day struggling up and down some hill or other. 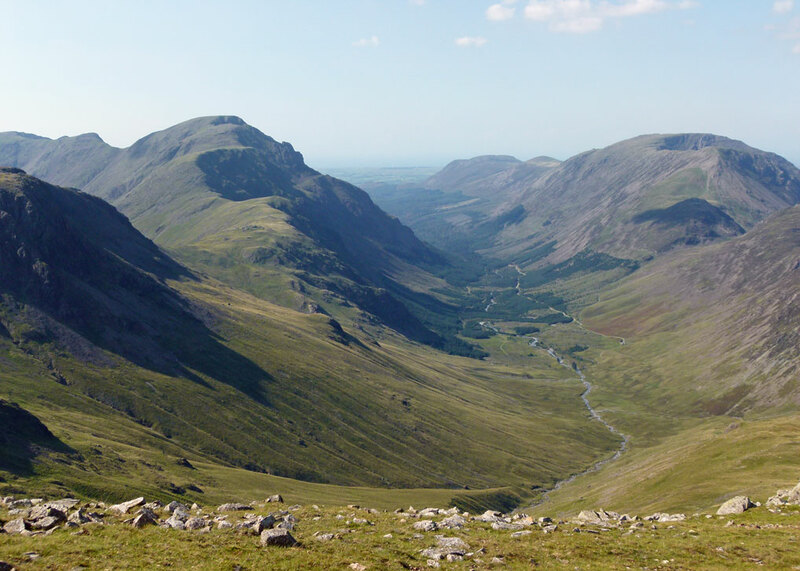 Great Gable was mentioned because it is an interesting walk, and so rewarding. We had tackled it together once before, when the skies had opened past the point of no return. The path chosen then was well-defined by thousands of tramping feet, so, unlikely to get lost, we pressed on in a stupid ‘we’re British, we can do it’ kind of way, wading through streams in full spate. I think this was before Bear Girls, or whatever his name is, had been invented. Visibility by the time we reached the summit was about 3 metres which, given that the place is renowned for its spectacular views, was a bit unfortunate. I remember various items of clothing hitting the kitchen floor with a dull ‘plop’ when we got home. Second time round, my delightful offspring assured me, with a winning smile, that the weather would be on our side. Bless him, he even convinced me to do a warm-up yomp in the Yorkshire Dales the previous day. I’ve often wondered when senility would set in and it seems it already has. 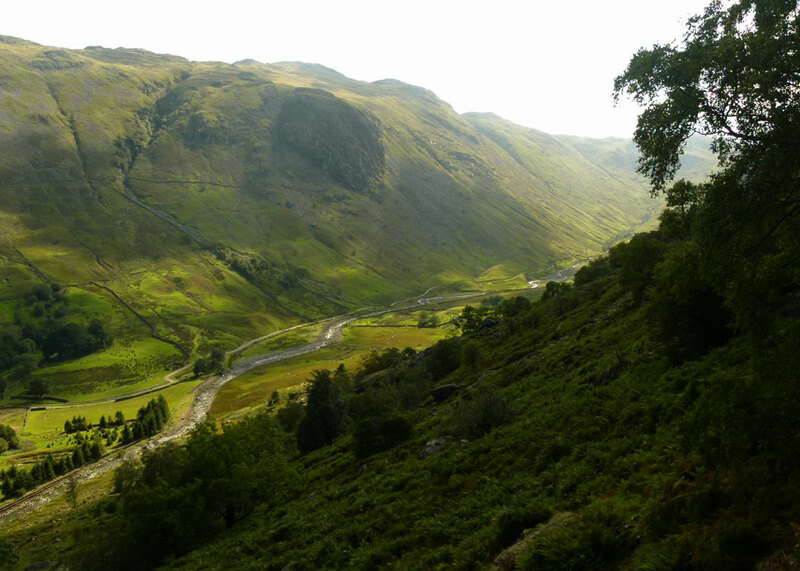 The route we took began in Seathwaite, at the end of Borrowdale. 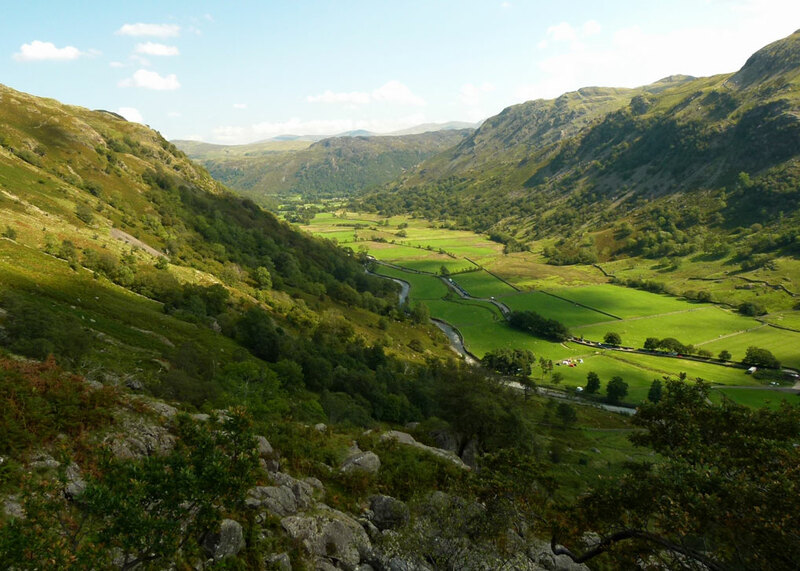 The road from Keswick passes through the Jaws of Borrowdale, a particularly narrow part of the valley; don’t you think that’s one of the most romantic names ever? Anyway, until moving to our current village I had understood Seathwaite to be the wettest place in England. Today, it was radiant in patchy sunshine. 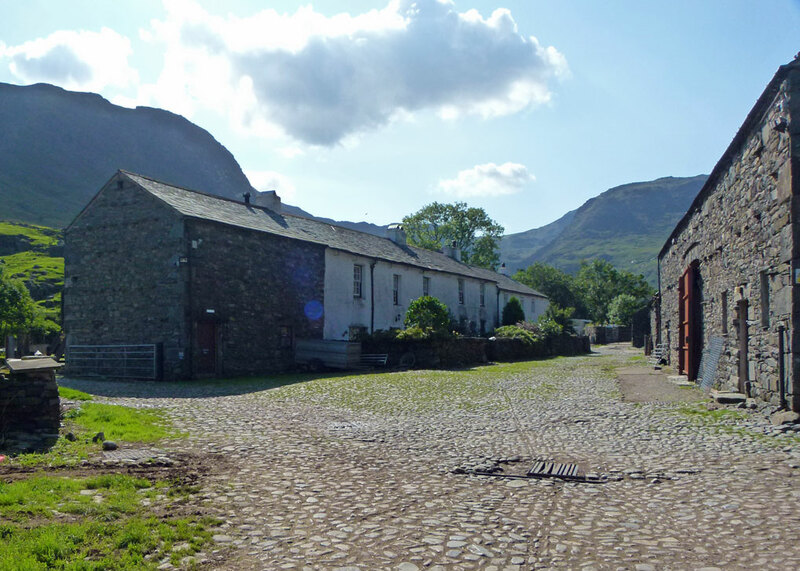 There’s not much to Seathwaite – it’s basically a farm with a fly-blown, but very useful, public loo, and a campsite. The circuit we took headed promptly and near vertically up the side of the valley next to Sour Milk Gill – the same route, in fact, my geography teachers had whipped me along – oh, it seems like only yesterday. Of course, walking is good for you and, these days I don’t do enough of it. This kind of terrain requires significant leg-lifting; I was out of breath climbing the first stile. By the time we’d gone a few hundred yards, the sweat pouring over my spectacles and into my eyes virtually blinded me. Once built for speed, today my body could be easily be mistaken for a comfy armchair. I could hear the blood pumping round all the vital organs; anything superfluous to the task of heaving my slightly bloated form up the side of the valley shrivelled and shut down. It’s meant to be good for the brain, though, isn’t it, walking? At the time I couldn’t tell – because my brain, obviously not needed, shut down too. (I know, smarty – t’was ever thus…) Anyway, for some bizarre reason, Doris Day singing ‘I Just Blew in from the Windy City’ came into my head and wouldn’t go away. But I must say that Son of Britain was very patient with his Aged P, stopping every so often and anxiously enquiring, from about three miles above, “All right, Dad?” Deep, whooping, gasps punctuated my replies as I tried to rediscover how to breathe. Being as unfit as an unfiddle means you get more opportunities to stop and admire what’s around you. And the Sour Milk Gill route is simply stunning. You’re never far away from the gill, either, which tumbles and bubbles happily and helplessly downhill to your right and, somehow, keeps you company along the way. 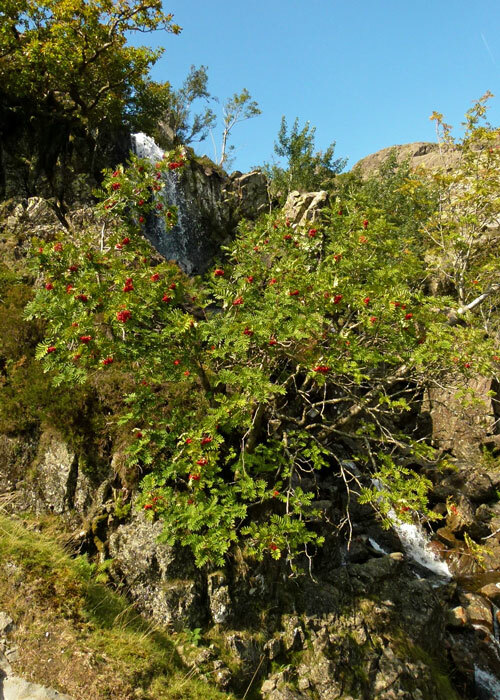 At the top of the climb was what I was looking for: a hardy rowan tree, resplendent with scarlet berries and splashed by a waterfall, clinging tenaciously to the rocks – just as I had always remembered it. Coming over the top, the verdant valley is quickly left behind. Suddenly, you enter a bleaker, treeless, world of short grass, mosses and rocks. I remembered that this was (and indeed still is) a hanging valley, where the path of a lesser glacier has been truncated by a much larger relative. 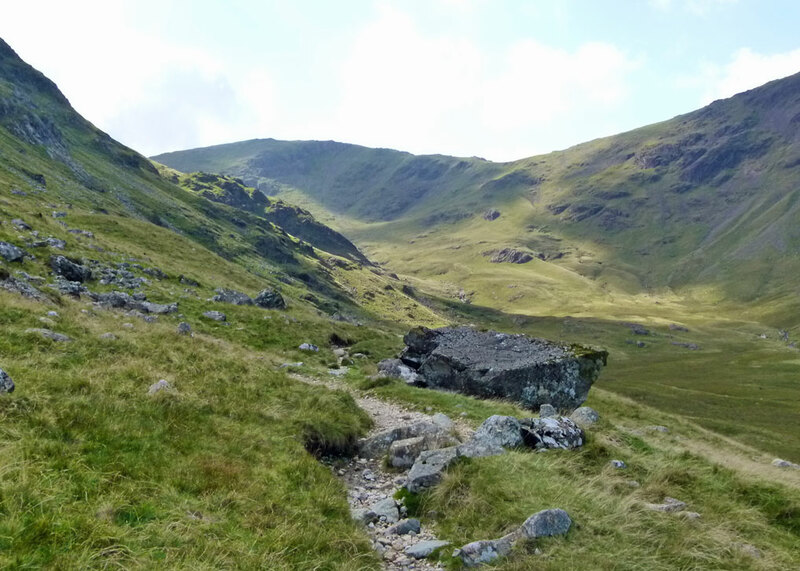 The valley is called Gillercomb and the path led us round a mass called Base Brown (2,119 feet/646 metres) in the direction of Green Gable (2,628 feet/801 metres), Great Gable’s supporting actor. Base Brown largely hid the sun as we skirted round it and we shivered as the sweat from the climb chilled. Coats were retrieved from rucksacks. 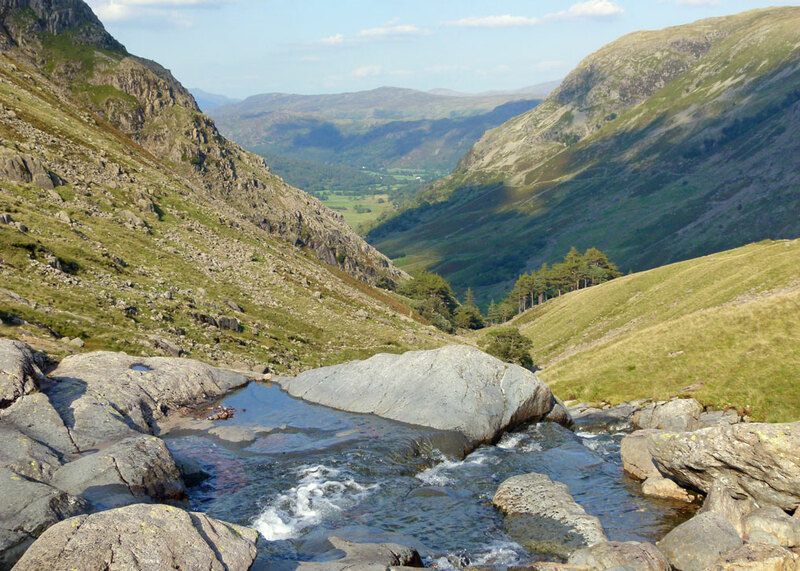 Despite the fact that the Lake District attracts more than 15 million visitors a year, most of them don’t venture too far from their cars and caravans. So in places like this it is possible to forget that other people have come this way and imagine you are the first. Getting into the rhythm of stepping from stone to stone, for some reason I kept thinking, “One ring to rule them all.” “Wait for me, Frodo!” I gasped. The folk you do meet are, generally, kindred spirits who smile benignly and say encouraging things like, “Not far now,” “Great day for it, eh?” or, as I recently discovered, “My God, you look terrible; are your lungs meant to be making that awful rasping sound?” We only met five other people along that part of the route – and a couple of trolls, of course. 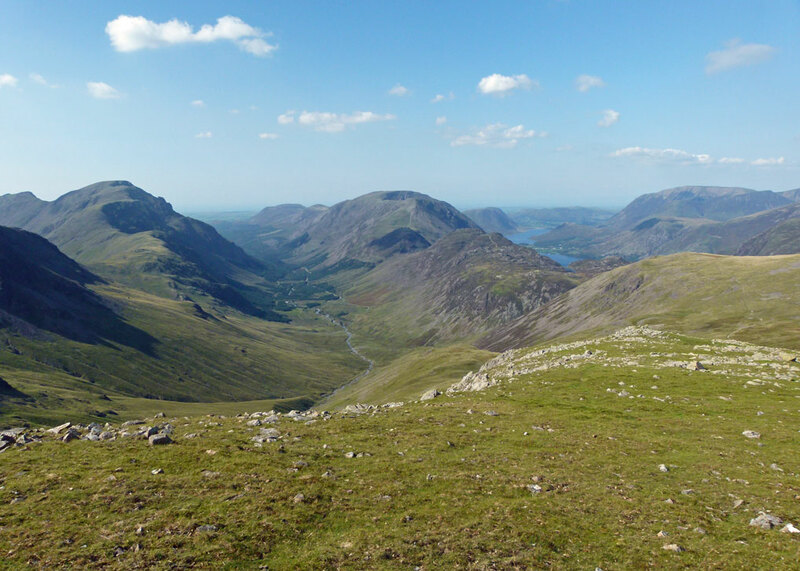 The path up to Green Gable is a bit of a slog, with several false horizons, until the most wonderful panorama unfolds to the north and west with views over the Buttermere valley and Ennerdale, the glowering peaks of High Stile and Pillar towering in between. 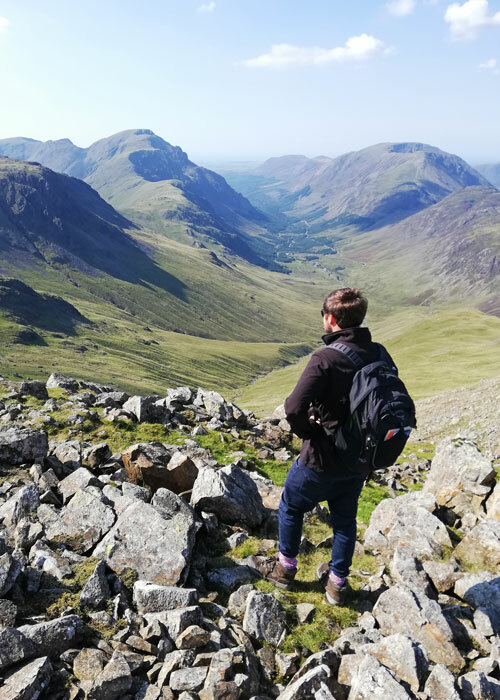 The views from the summit of Great Gable are even better; it’s a good place from which to appreciate the Lake District’s radial drainage, with the lakes and valleys famously radiating out like the spokes of a wheel. We have mentioned ‘best views’ elsewhere on A Bit About Britain; these things are always relative, but it’s hard to beat the outlook from the top of these volcanic rocks formed 450 million years ago and now resident, for less than the last thousand of them, in North West England. From Green Gable, it’s a precarious step into the dusty pink scar of Windy Gap, the col between Green and Great Gable, before the clamber up the other side onto the rock-strewn top of Great Gable itself. 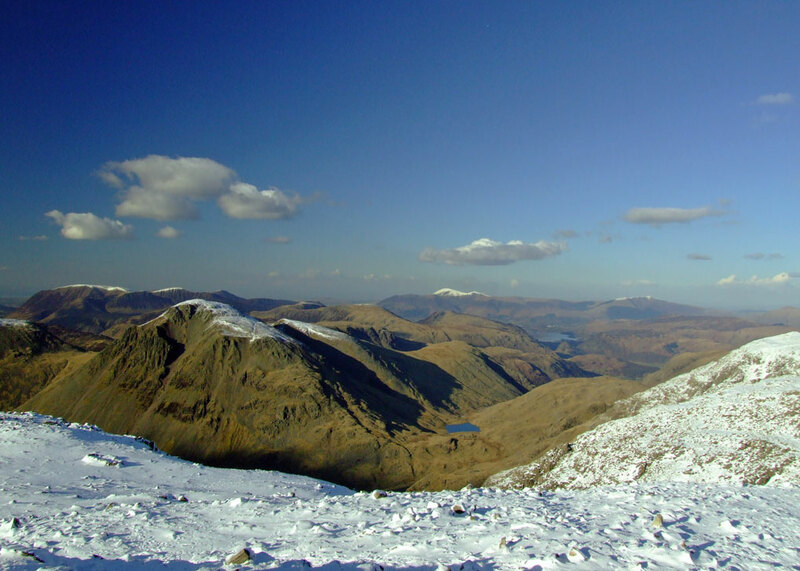 The highest point of the mountain is a respectable 2,960 feet (899 metres), where a bronze plaque commemorates members of the Fell and Rock Climbing Club who died in the First World War. Memorial services held on Remembrance Sunday are often attended by hundreds of people. It makes you think about the last time you do something, not realising that it is. Today, though, we decided to give the summit a miss. It was the sensible decision. We had started later than intended and wanted to get back before darkness fell. We descended with the sound of rushing water beneath our feet, down the rocky scree-like Aaron Slack, which is a topographical feature, not a person with an unfortunate name. At the bottom is diamond-shaped Styhead Tarn. 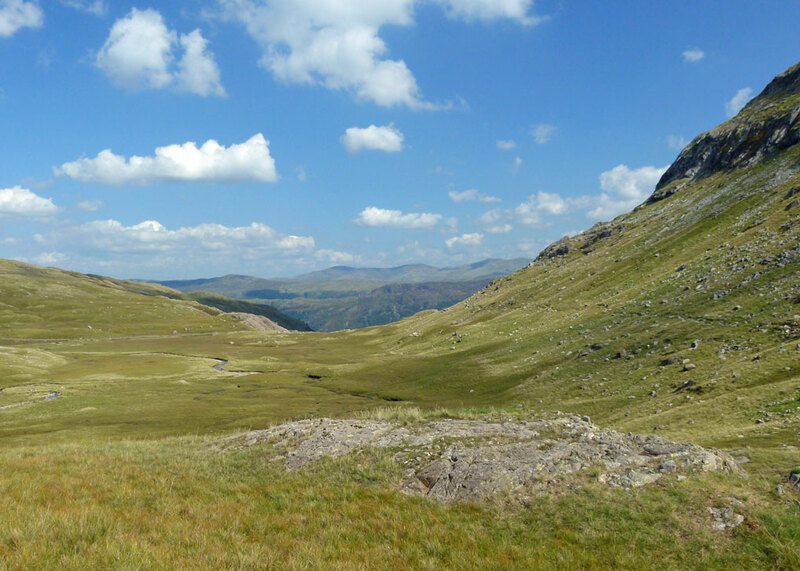 Styhead is a mountain pass – a walkers’ junction, with paths leading off in all directions. I read that some barbarian had once proposed to lay a road over it; God forbid! 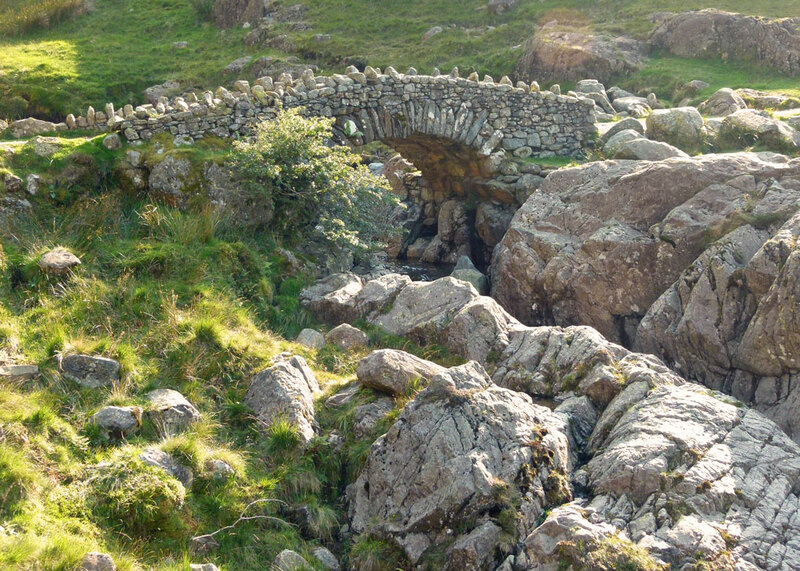 The path back toward Seathwaite is a little tricky alongside part of Styhead Gill, where it’s necessary to pick your way carefully to avoid marshy areas; then across Stockley Bridge, a packhorse bridge dating from the early or mid-18th century and, Bob’s your uncle, you’re back at the car. There are few better ways of spending a day than doing a decent walk. It’s companionable, even on your own – though better, naturally, in good company… Part of the requirement, for me, is a picnic along the way (we had ours just before Green Gable, if you must know). Great care must be taken in the selection of the right spot; a sharp rock has ruined my cheese and pickle sandwich on more than one occasion. Spare supplies – and there have to be some in case of emergency – can be eaten when completion is not in doubt. At the end is a quiet sense of achievement and the day is always nicely rounded off with a few pints of Throat Grobbler or similar. Perfect. I’m lucky to have experienced it. As usual, photo captions will appear if you hover your cursor over the image. A couple of the photographs aren’t mine and have been appropriately credited. For those who are more serious about walking, take a look at the Walking Englishman. Meanwhile, here’s a short clip of the view from Green Gable; sorry about the wind. 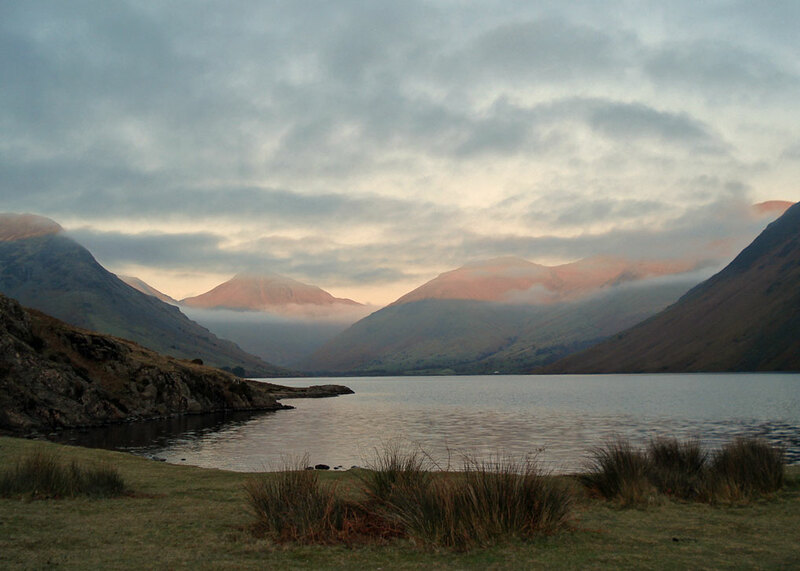 We love the Lake District, fabulous post and pictures here. I did enjoy this. It brings back memories. My only climb on Great Gable was from Wastwater visiting the ‘Climber’s Traverse’ on the way up in order to see Napes needle. Your shots from the summit of Green Gable are splendid, including that great view of Pillar at the head of Ennerdale. Wonderful! I wish I could be there again. More walks like this please. I’m still recovering, Richard; but I’m glad you liked it! For your efforts you certainly got some rewarding views. Simply fabulous pics, Mike! I’ve never hiked there but seeing what i’m missing gives me food for thought! Superb photos, Mike! I am so pleased you accompanied Son of Britain on this beautiful walk. I have been to the Lakes a few times but have never climbed any of the larger mountains. I am sure I would be absolutely out of breath quite quickly but would love to see the views you have shown here. Thanks so much! 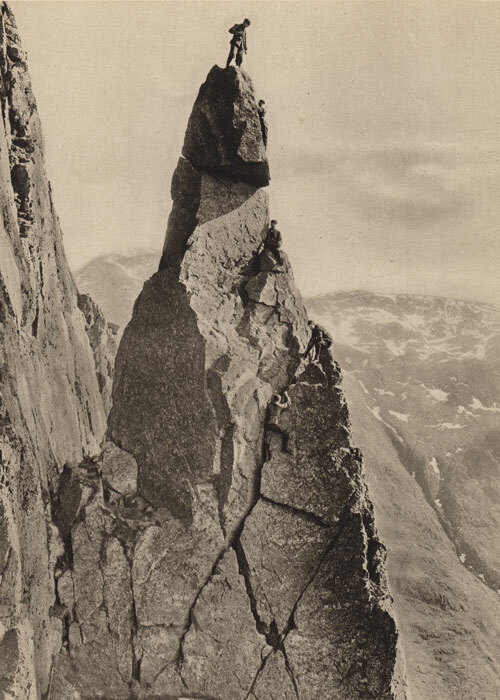 Ah, Hilary, as you might have seen, the last shot is from the 1930s and is of Napes Needle on the side of Great Gable. I can’t even make out if the climbers are roped! Thanks for another entertaining read and such superb photos. Climbing is one of many unfulfilled ambitions for me. By the way, we have a ‘Windy Gap’ just a mile up the road from here. At a piddling 190 metres it’s not as spectacular as yours but it does afford delightful views across the Barrow valley towards the Wicklow Hills. I can’t quite see it from my window, there’s a wooded bluff in the way, but I quite often traverse it on my trusty bicycle, as well as a few slightly stiffer climbs in the vicinity, all on metaled roads. Thanks, Frank. It’s all about quality, is it not? I enjoy a good walk, can cope with a bit of scrambling – but real climbing? – no thanks! Thank you for sharing your hike…it was just the arm chair travel I needed this week, mending in a a body that some of your descriptions might also work for…you made me laugh, by the way. The pictures are wonderful. Glad it raised a smile 🙂 It’s hard to take bad pictures round there on a day like that! The field trip sounds like a Plan; bring the parents too – we’re not proud. “Dead Horse Creek Trail” – really? Fabulous name and, of course, very romantic… I hope you have renamed it, even if only unofficially, ‘The Clare Trail’ now. Oooh, I like that name! Thank you! Hop on a plane sometime…! Wonderful there is nothing like the Lakes when the sun shines. You got further than I would have done! And what superb views. Worth it I’m sure! I’m sure all you do in that wonderful garden of yours keeps you fitter and trimmer than most of us! This is so much my kind of walk/hike, I truly wish I could have come along with you and Son! Also, it eases my mind a bit, knowing other people experience similar symptoms as I did during our ascents to various peaks while on holiday in the Bavarian Forest: the sweat, the breathing, the mind getting stuck on some song or other, and so on. Only that I am a bit younger than you are, and my body should wait a few more years until it starts behaving like that! The photos are wonderful and I really, really long for more of the same. Now there’s another daft idea you’ve put into my head! Used to go up there fairly regularly leading walking groups – the weather was never as clear as it was for you, even when we started off in brilliant sunshine. Congrats on completing a classic walk! What gorgeous countryside. I’d love to walk there. But it might be a bit too much for my two hip replacements. I spent my younger years in North Devon, running up and down those steep hills like a rabbit, but I’ve lived too long on flat land to be able to manage long uphill trudges. Some very steep hills in North Devon – lovely around Lynton and Lynmouth. Just starting my eleventh-eleventh reading of the Hobbit and could easily picture Bilbo and his buddies trudging in your footsteps. Thanks for the amazing photos! Jaw dropping, magnificent landscapes. I’d love to go there someday. Now here’s a sad confession. 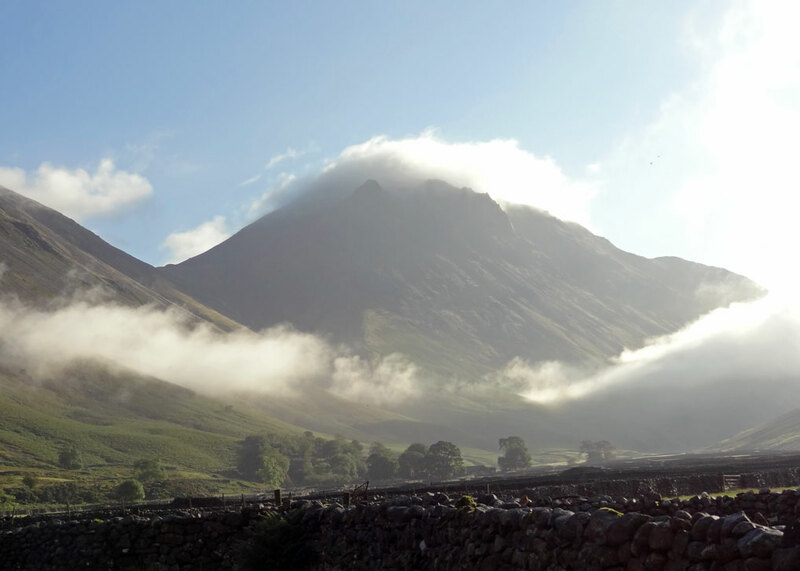 I’d never heard of Great Gable until I read your post. And what a loss that has been for me. I immediately wanted to dredge up those hiking boots, pack a lunch and head out. 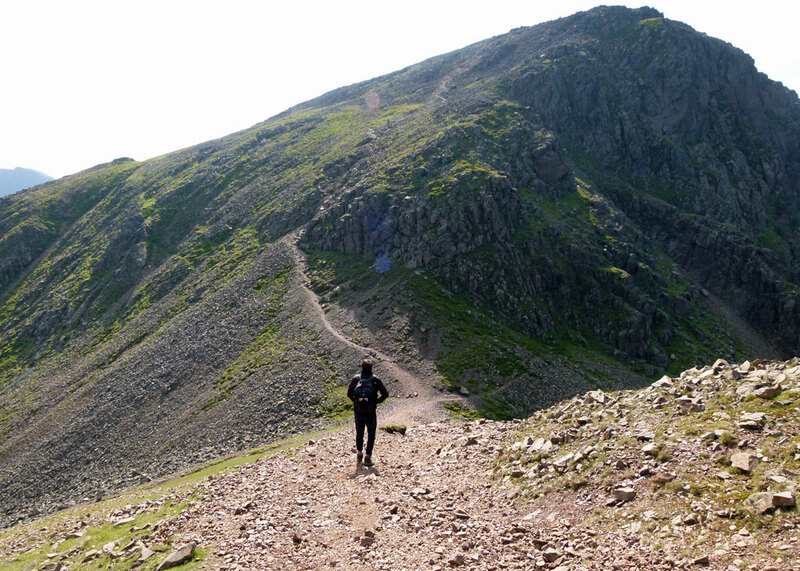 Unfortunately, reaching Great Gable would require a long airplane ride and a bit more planning. However, now that it’s on my radar, I’m determined to have a visit. It’s such a long way – make a weekend of it 🙂 Joking aside, it’s a lovely part of the country. Wonderful. Congratulations on not dying on the way up. Well, that raised a giggle – thanks! I am very glad that the young entry persuaded you to do the walk as otherwise there is no way that I would have been able to see the scenery you describe in both word and picture. I used to walk the Scottish hills with my father when young…but these days the first stile would have been enough to have the knees on strike. Oh Mike — wow. This is a place I’m pretty sure we won’t get to — but I can see why it would be well worth the visit! Glorious! Just sent you an email with a bit on our trip and such. Now I’m off to explore here a little more!